We moved onto the tent lines in August 1953 and our first tent was pretty close to the rear entrance to the YMCA and the dhobi wash house. My first bed was a rolled up canvas type with strong wire cross struts and legs which gave six inches of clearance off the ground. !! If you rolled around too much, it tipped you out. Later we were isuued with fold up beds which were just a bit higher. Our tent was pitched just about where the R is in REGT. on the map so perhaps the RAF REGT were in residence some time prior to our arrival. Our second tent with brick walls and concrete base was just about where the Cooks & Catering shows on the map. Our first tent - they were manky old tents !!!!! The view from our tent , positioned in the first row of tents near the YMCA. This was Christmas morning1953. The Kasfareet village guardroom in the distance is hidden by the tent. Still hanging around the tent. John Mayo from Blackpool ready for guard duty. Note the low lying beds. Our gang. Johnny Mayo, myself, Roy Whistance and Don Lovatt, the last two being from Brummieland. I am enjoying the evening sun. Just practising my cheesecake pose ! Three shots of me enjoying a late smoke before sunset. Small plaque in my shadow says "The Shambles"
Tony Maskill. The tree behind is on the camp road leading left to the Sweetwater Guard Room. 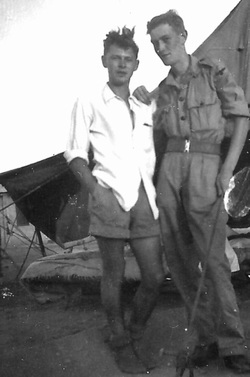 Roy Whistance front then Tony Maskill with me at the back.The building is next to the central cross camp road. All dressed up but I wonder where I was going ? Roy Whistance left with John Mayo and Michael (Ginge) Norris seated. Mini water chatti hanging up. Yes, I did fall off !! Roy Whistance flying down the tent line. Was this a bad case of Gyppo Tummy ? but that is my pit !! Reposing on my pit listening to the local forces network on my crystal set valve radio. The valve came from stores, the earphones inherited from someone and kept under my pillow when not in use as with a crystal set there is no switch, it is on all the time. Prior to the earphones I had a telephone handset as a receiver !!! One of the Brylcreem Boys. A picture of me perched on the top of our first tent C3 !! Not the normal practise but Colin Harrington`s Page shows tents storm damaged and I am afraid ours suffered likewise. The top waterproof sheet split from top to bottom so I `searched around` for one not in use and replaced it. Simple. Outside our new tent with Ginge. The old wooden armchair had been discarded by someone else so I grabbed it for our tent. Me all toffed up for sunday evening church service. Well, it helped to pass the time. Help wanted...I have no recall whatsoever of the famous chariot race but am I sitting on the remains of one next to our new brick sided tent ?